Filter press - Ecokube sp. z o.o. Excessive sediments – products of biological sewage treatment – demand dehydration. 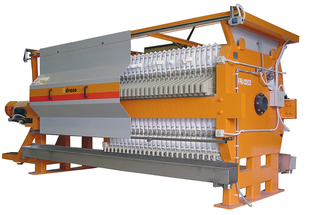 This problem is solved by the filter press that enables to achieve the highest possible dehydration level (up to 40% dry weight). Reagents (coagulant and flocculent) and lime are added to sludge right before the process. Due to that sludge loses more water and it does not attach to the filter mat. 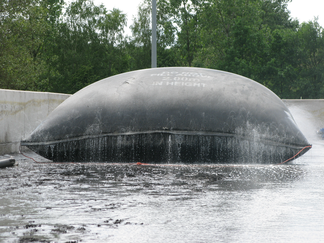 At the end of the process sludge is removed to the container. The system is fully automatized and the costs of exploitation are low. We offer three types of presses. Excessive sediments are mixed with reagents in a small container. 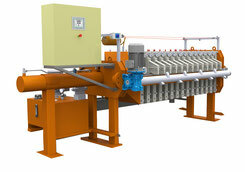 Sludge flocks are transported into the press, where rotating disks dehydrate them. 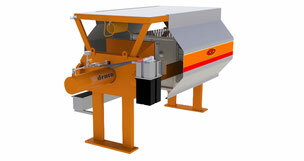 This simple and low-cost system dehydrates the sludge into 20% of dry weight. Pieces of device that touch wastewater are made of stainless steel. It is a spinning drum filled with sludge. Centrifugal force causes separation of solids and water. Dehydration level reaches above 20%. This technology does not demand a lot of water, it is highly automatized and aesthetic. During one cycle the screw compactor has several functions: transport, dehydration and thickening of municipal and industrial sewage sludge, minimization of their volume and amount of water. This device is particularly suitable for thickening suspensions from filtration and straining processes as well as post-production waste. Compactors are compact devices, they offer high efficiency, and their installation does not require a large space and specialized construction works. The construction of devices protects mechanical parts from contact with sewage and guarantees long working time. The technique of hollow shafts reduces the possibility of blockage while increasing transport possibilities - quantity and diversity of transported materials. Each section of the compactor is protected by a lid that provides a hygienic and odorless process. The transport chamber has an opening through which the material falls directly onto a screw conveyor with a hollow shaft. The screw rotates on a slippery surface, transporting material through the transport chamber towards the filter and the compaction chamber, where suspensions, sand and oily materials are collected. The water is removed by drainage pipe located in the lower part of the chamber, and the suspension by regulated pressure outlet. This method is an alternative to centrifuges and presses. Sewage sludge is drained in elastic containers made of filter fabric that resembles geotextile. That fabric also prevents re-absorption of moisture from atmospheric precipitation during the dewatering process. For this reason roofing is not necessary. Installation of containers demands only simple preparations in the area and minimal construction works, without buying expensive devices or executing complicated construction works. The system does not require heating, pouring, mixing or energy transport. Containers are set on flat, sealed ground and filled with sludge of any level of hydration and reagents. 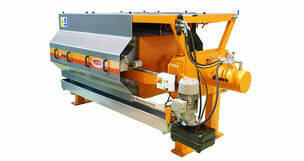 That system enables to obtain up to 20% dry weight. 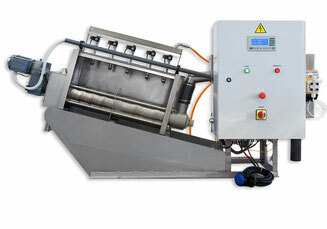 The costs, however, are noticeably smaller than in other sludge dehydrating technologies. To obtain a good level of dehydration it is necessary to add polyelectrolyte to the sludge. Leachate parameters reach 50-100 mg COD. Some of that can be used for technological purposes – diluting the polyelectrolyte, for example. When the wastewater treatment plant is exposed to seasonal changes of load (as a result of tourists arrivals, seasonal production nature, etc.). In that case elastic containers may solve the high-peak dehydrating needs.